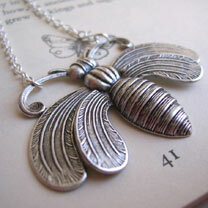 Art-nouveau inspired beautifully detailed bee pendant. Silver. Bee 5 x 4cm, chain length 17" (43.2cm). Nickel-free, handmade and gift wrapped.